Statius' Achilleid is a playful, witty, and open-ended epic in the manner of Ovid. As we follow Achilles' metamorphosis from wild boy to demure girl to lover to hero, the poet brilliantly illustrates a series of contrasting codes of behavior: male and female, epic and elegiac. This first full-length study of the poem addresses not only the narrative itself, but also sets the myth of Achilles on Scyros within a broad interpretive framework. 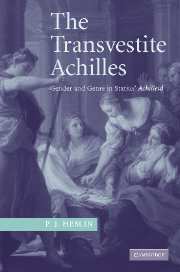 The exploration ranges from the reception of the Achilleid in Baroque opera to the anthropological parallels that have been adduced to explain Achilles' transvestism. The study's expansive approach, which includes Ovid and Ovidian reception, psychoanalytic perspectives and theorizations of gender in antiquity, makes it essential reading not only for students of Statius, but for students of Latin literature, and of gender in antiquity. • Adopts an interdisciplinary approach of interest to students of Latin literature, myth, gender in antiquity and Baroque opera.